MADISON, WI. (January 3, 2019) -- Emails obtained via open records requests reveal a pattern of deception by Edgewood High School regarding its proposal to build a new stadium with lights and amplified sound in the residential neighborhood adjacent to Lake Wingra. The emails from Middleton-Cross Plains Area School District officials reveal that Edgewood High School’s frequently repeated claim to the public and the city that it needs to build a stadium because it lost its agreement to continue renting Middleton High School’s football field is false. All emails obtained via Open Records Request. 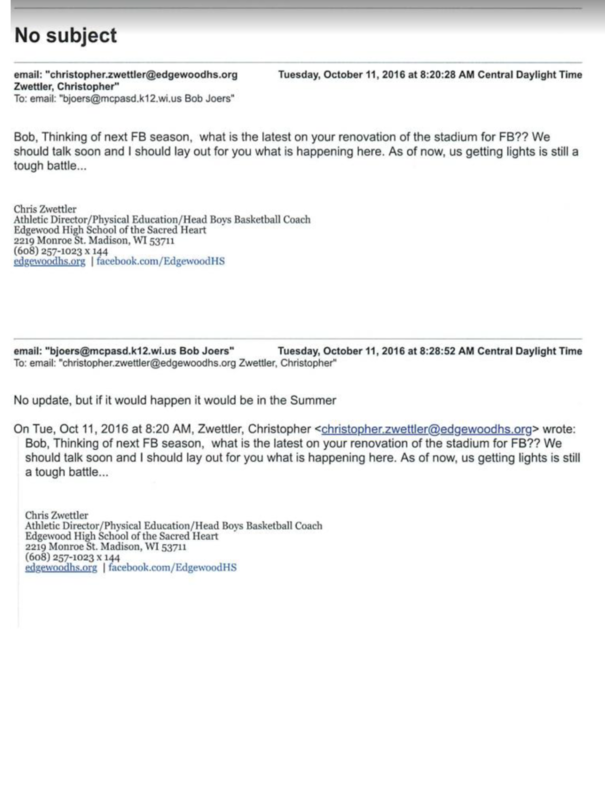 The emails show that Edgewood High School could have continued to play their home games in Middleton, contrary to its claim to the city that “Prior agreements for use of Middleton’s field cannot be extended, leaving Edgewood without predictable locations and often last on the list of requests to host games.” (Sept. 13, 2018 email to the city from Brian Munson of Vandewalle & Associates, the PR firm hired by Edgewood to advance the stadium proposal). “Many of those who attended Edgewood High School’s public meeting this fall came away with the impression that Edgewood needs a stadium because they ‘lost’ their agreement with Middleton,” says Dudgeon-Monroe neighbor Dianne Jenkins. Edgewood did not lose its right to play home games in Middleton but rather declined to continue doing so of its own accord. “These latest revelations compound a pattern of dishonesty in Edgewood High School’s dealings with the neighborhood,” says Tag Evers, Dudgeon-Monroe resident and District 13 aldermanic candidate. This has created a huge credibility problem among neighbors, including Dudgeon-Monroe resident Jamie Domini. No New Stadium is a grassroots organization of neighbors who oppose Edgewood High School’s proposal to build a stadium with lights and amplified sound on its Monroe Street campus. The group was formed in October 2018. The Monroe-Vilas area provides a model balance of commercial vibrancy, greenspace, and peace. This balance is an asset we wish to defend and preserve. Learn more at nonewstadium.org.